It may surprise you, but anti-Gravity treadmills aren’t just for astronauts. They are also rehabilitation devices used by hospitals and sports teams, as well as a training aid for long distance runners. The G-Trainer, made by Woodway treadmills, is one such anti gravity trainer that has been used by professional sports teams to shorten the rehab time of injured players. 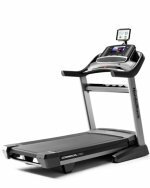 Even the physically fit use it: former world-record marathoner Alberto Salazar, and Olympic marathoner Paula Radcliffe, as well as many others, have trained on anti-gravity treadmills to better their times, as well as use them for injury recovery. The G-trainer is also being used as a pioneering medical rehabilitation treadmill in hospitals to help amputees learn to walk with their new prosthetic limbs. Patients can teach themselves faster while inside the specialized treadmill without the assistance of others and using a wider range of motion. It helps with coordination as well as confidence since the anti-gravity trainer holds them safely in place without fear of falling. If you’ve ever run or walked on a treadmill for up to an hour, you’ve likely experienced some weird wobbliness once you got off the machine, and it takes a few minutes to get your land legs back. It means that your central nervous system had adapted to the treadmill gait in just that short amount of time. 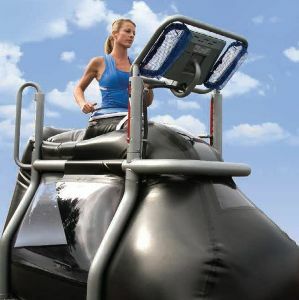 The Anti-Gravity treadmills are also performing this type of locomotor retraining, but the goal is to have permanent results. The anti-gravity trainer works like this: The user puts on a pair of special compression shorts made of neoprene. Then they step inside the bubble containment chamber which surrounds their lower body but leaves the upper body (chest and head) outside the unit. The user is zipped snugly inside the chamber, just as a kayaker is enclosed in a waterproof skirt on his kayak, and air is then pumped in while the user walks or runs on the treadmill located inside the bubble. As the pressurized air lifts him up, the user feels about 20% lighter. It’s an amazing sensation: the effects of the chamber are akin to running in water, or floating in a zero-gravity environment. With much of the affects of gravity removed, workouts can then be much longer and more productive. Limbs and muscles don’t tire out as quickly, and endurance and stamina increase. Long distance runners improve their race times because they can run more miles every week, yet the stress on their muscles and joints is significantly lessened. Hopefully, someday we will all be able to work out in anti-gravity treadmills at our own health clubs and gyms and experience the high of space age training.